So I had to make another one, this time a little bit wider at the hinges of the clasp frame. 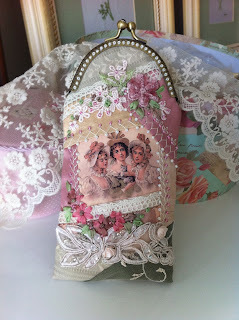 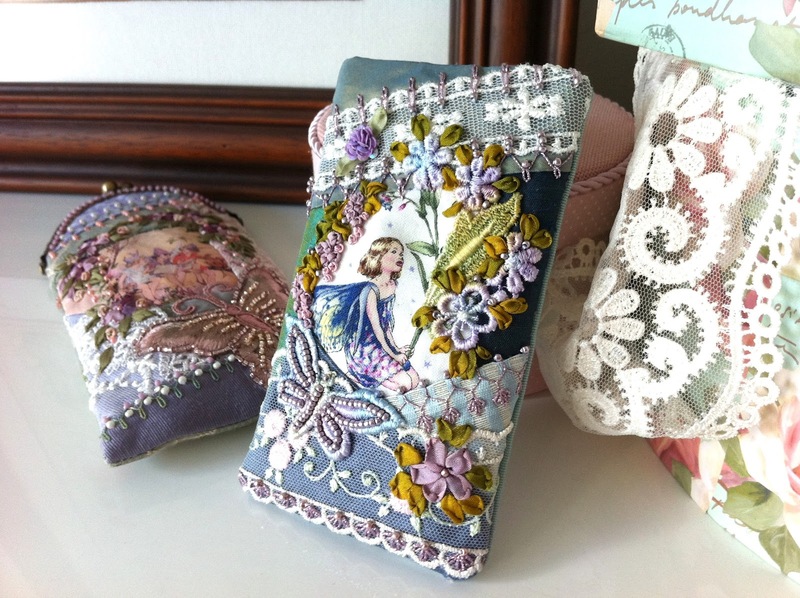 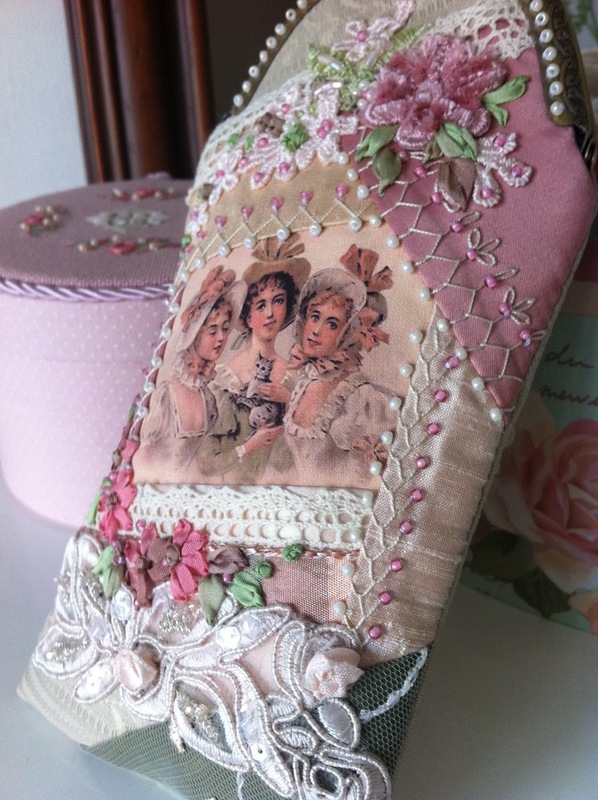 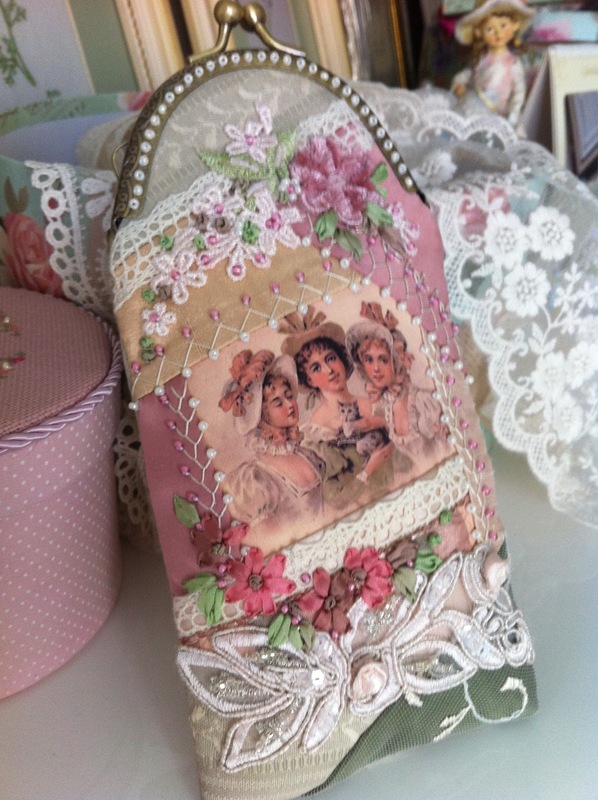 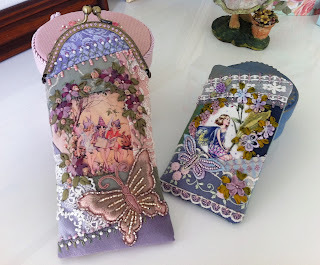 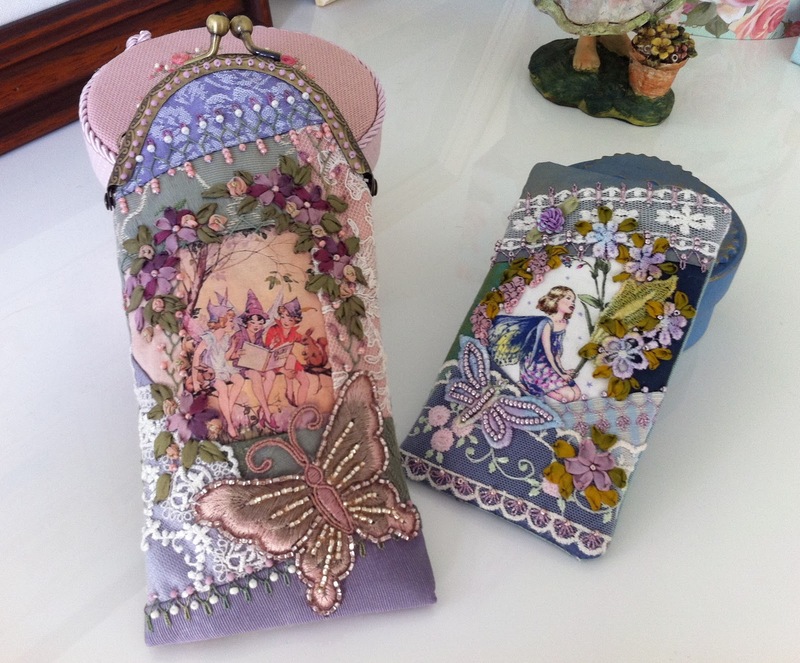 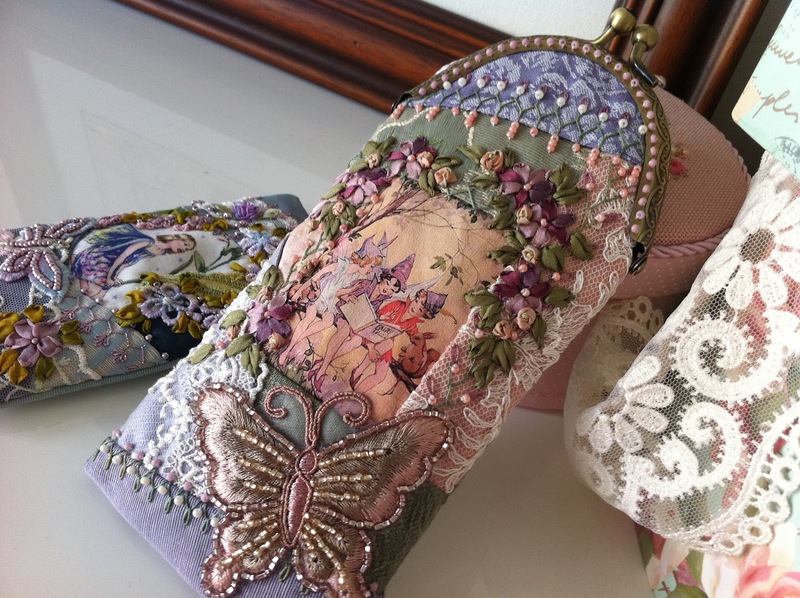 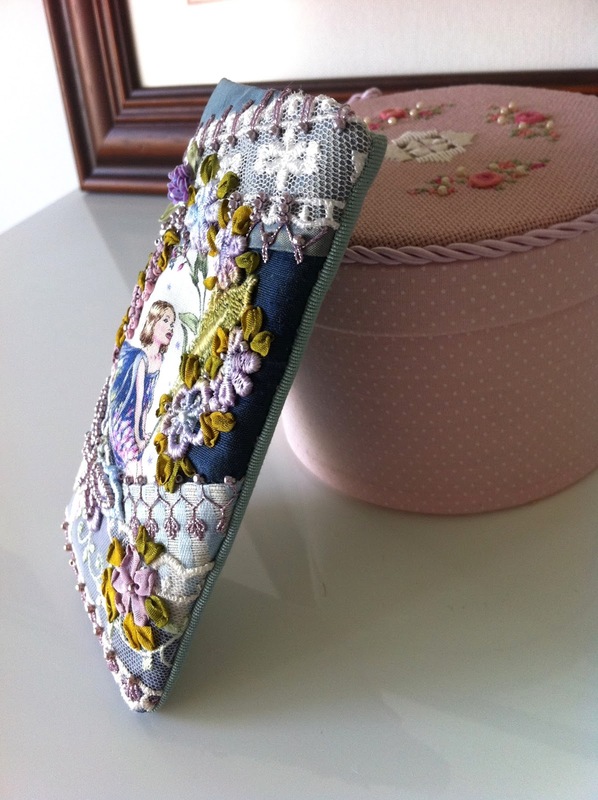 I had a go at attaching my first clasp frame to an eyeglass case I've pieced and embellished a couple of days ago. 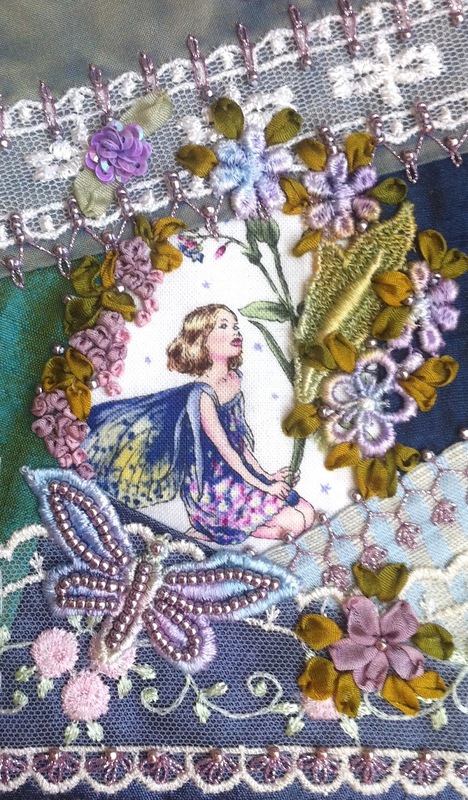 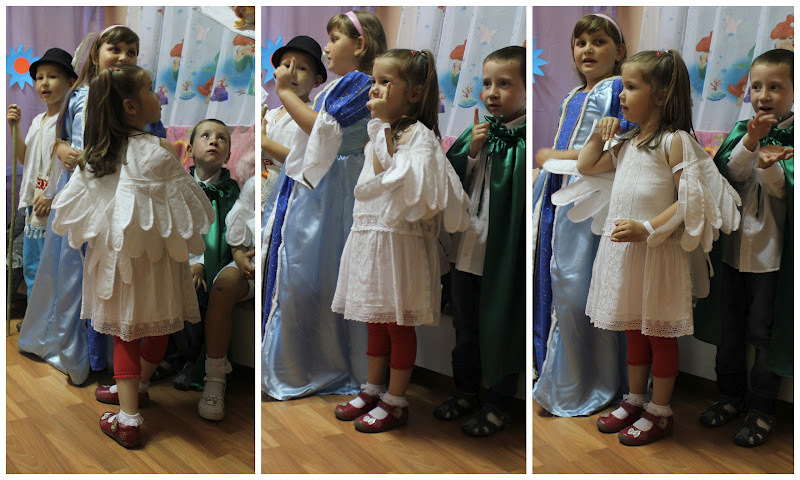 How cute are those little fairies reading their fairy tales book?! 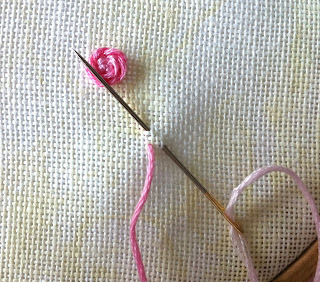 Last, but not least in this DYB it was the turn of Ati's block for me to work on. 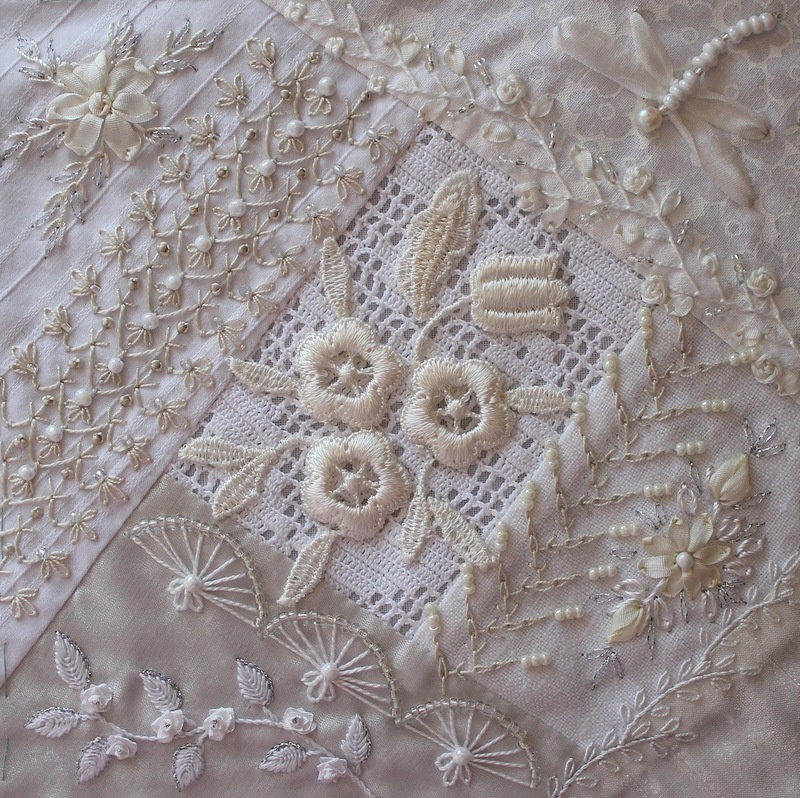 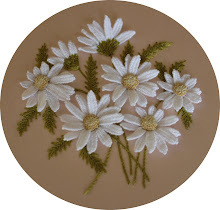 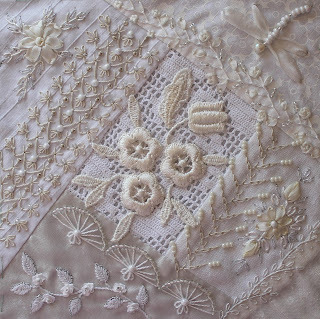 She pieced lovely white-off white blocks, each with a vintage piece of crochet lace or cutwork embroidery in the center and we were to use white, off white and silver embellishments. PS: I know I promised you the tutorial for the rosebud and leaves to be my next post, but I have been having a hard time taking good photos - and believe you me, I have been trying - so consider this post the one before the next and be sure that the tutorial will be posted too, as soon as I can take usable photos. 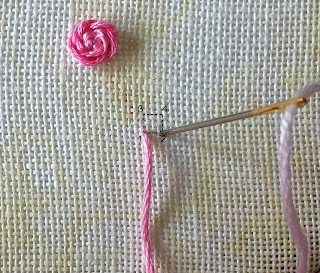 Today's stitching time was spent playing with a couple of stitches in the company of one of my favorite embroidery books and my doodle cloth. 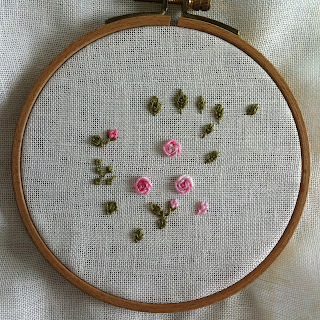 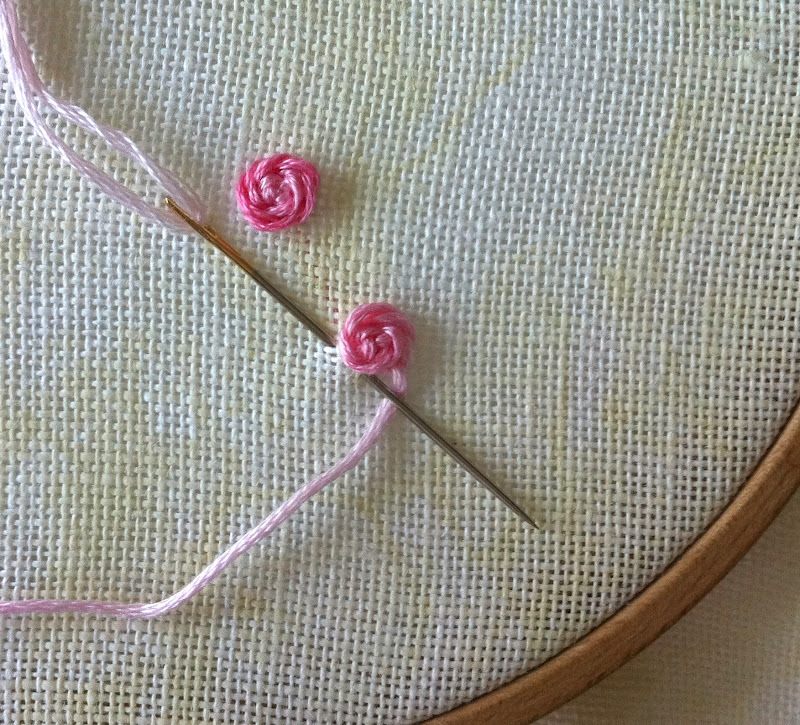 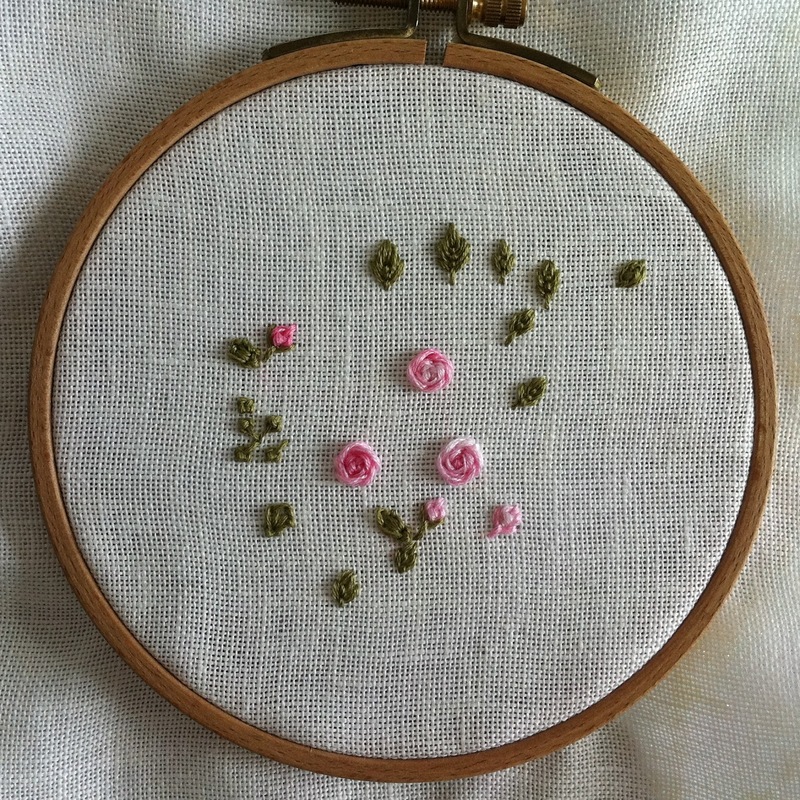 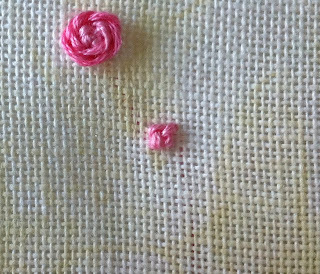 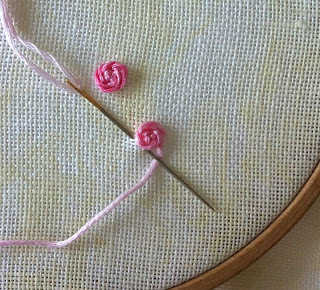 To stitch this rose first imagine (ha!) 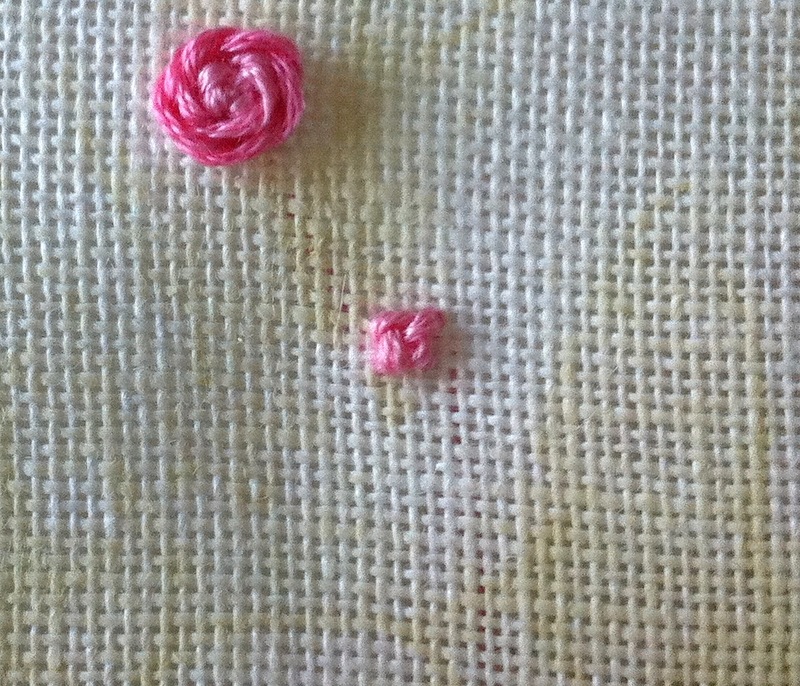 a small square, as marked on the photo below. 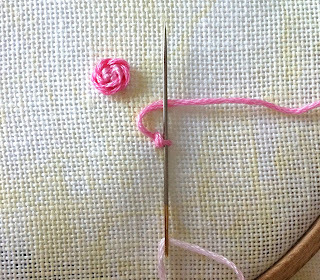 Bring your needle up in 1 and take it down in 2. 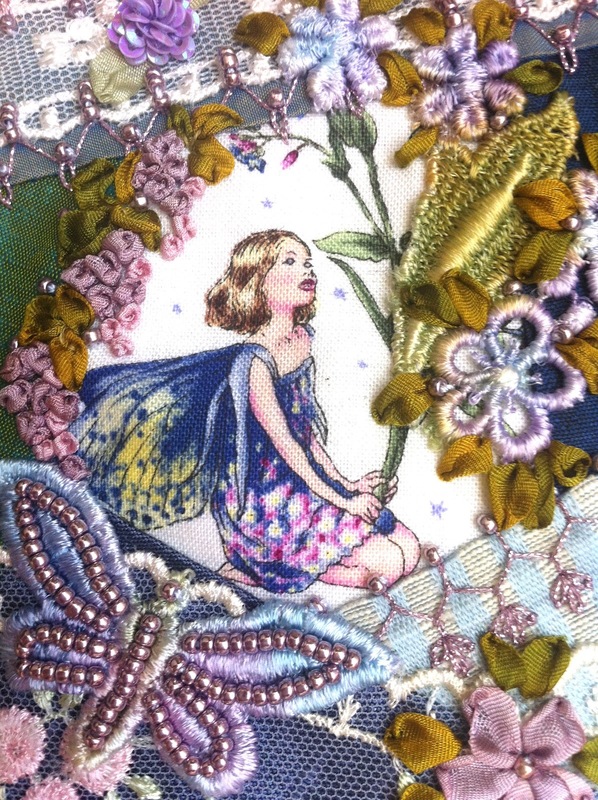 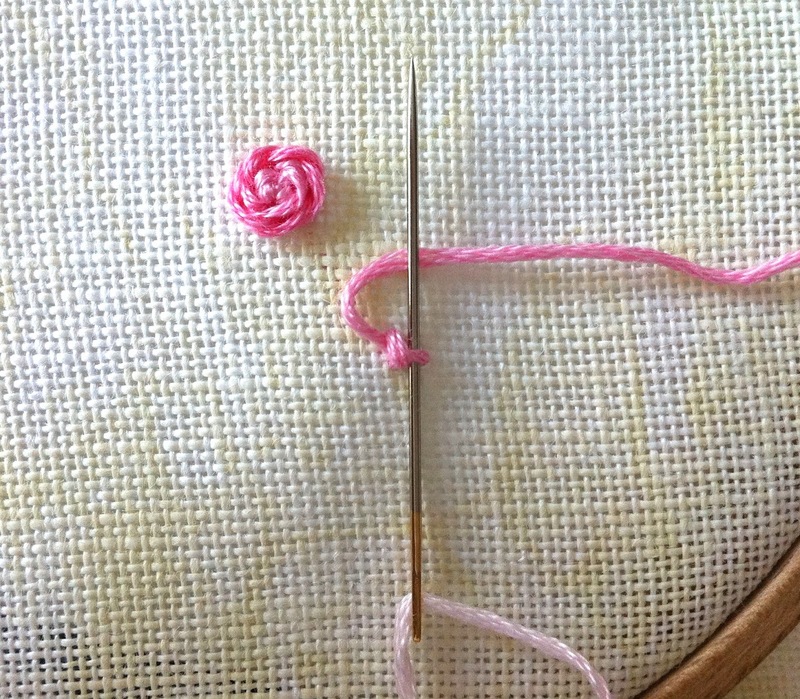 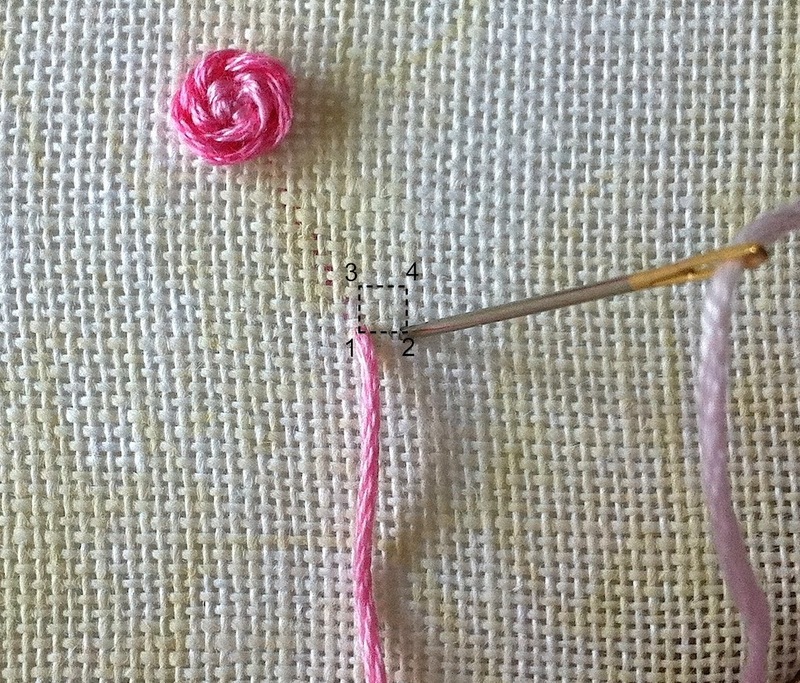 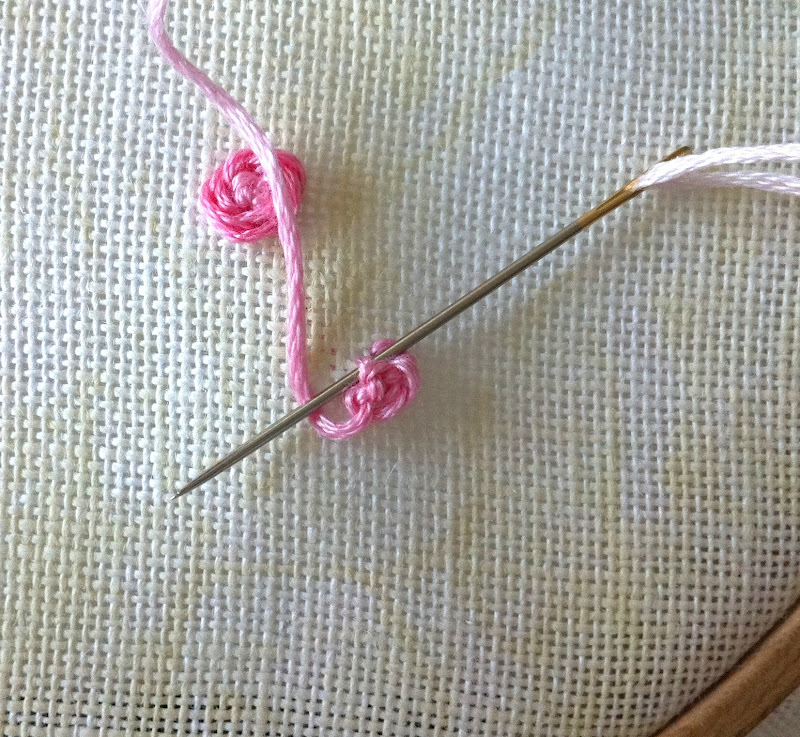 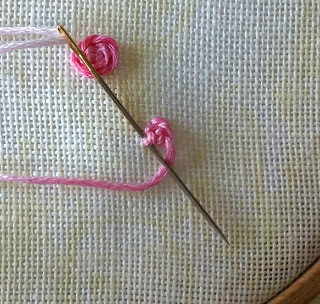 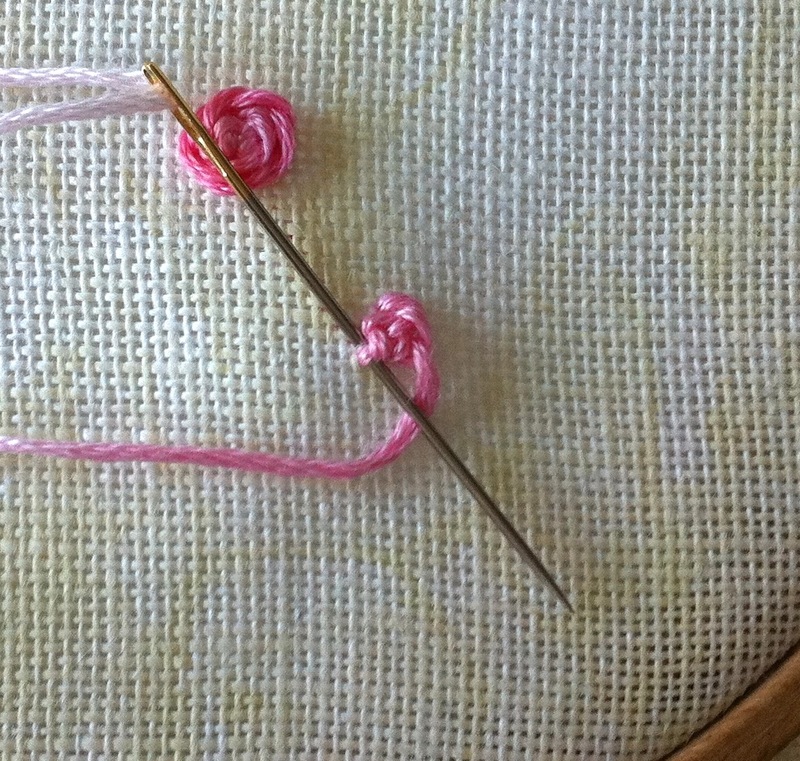 The next stitch will not go through the fabric, but under the straight stitch: bring your working thread down over the straight stitch and slide your needle under the straight stitch, pulling to the left of your working thread. 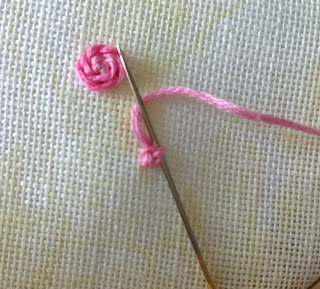 and take your needle down in 4 (the upper right corner of our imaginary square). 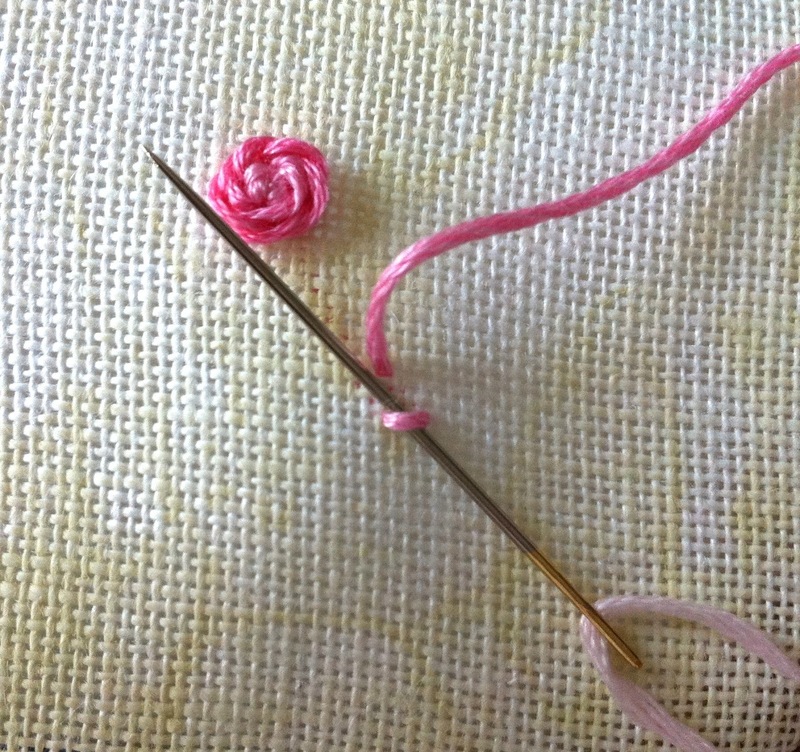 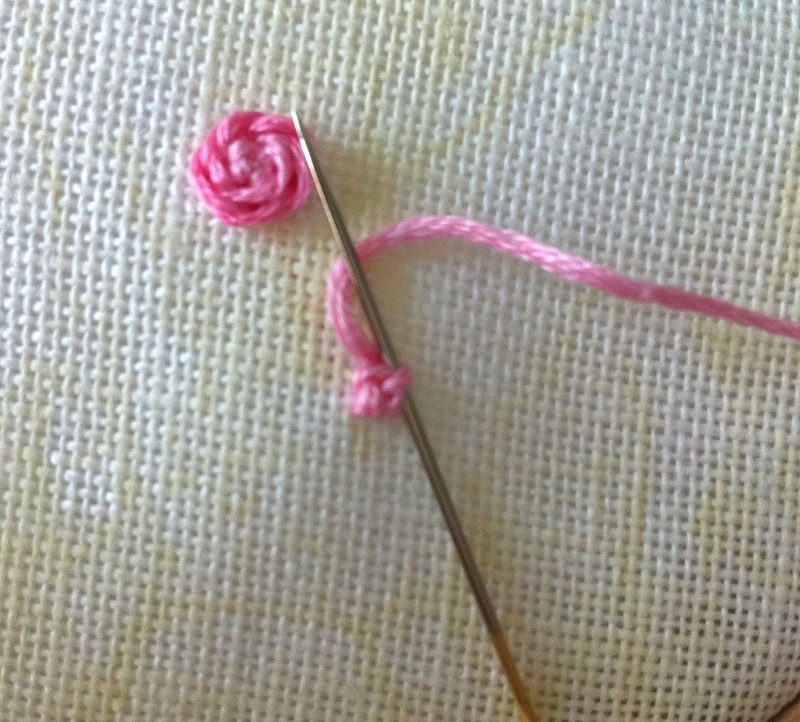 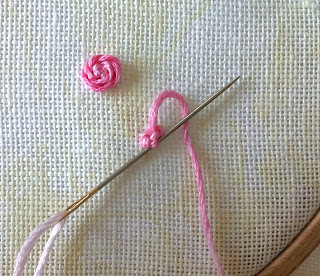 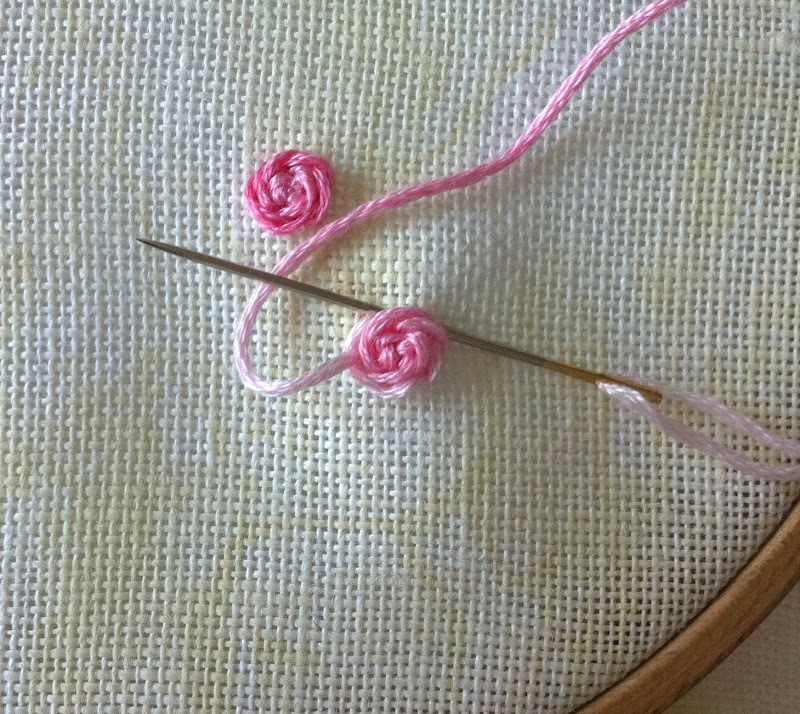 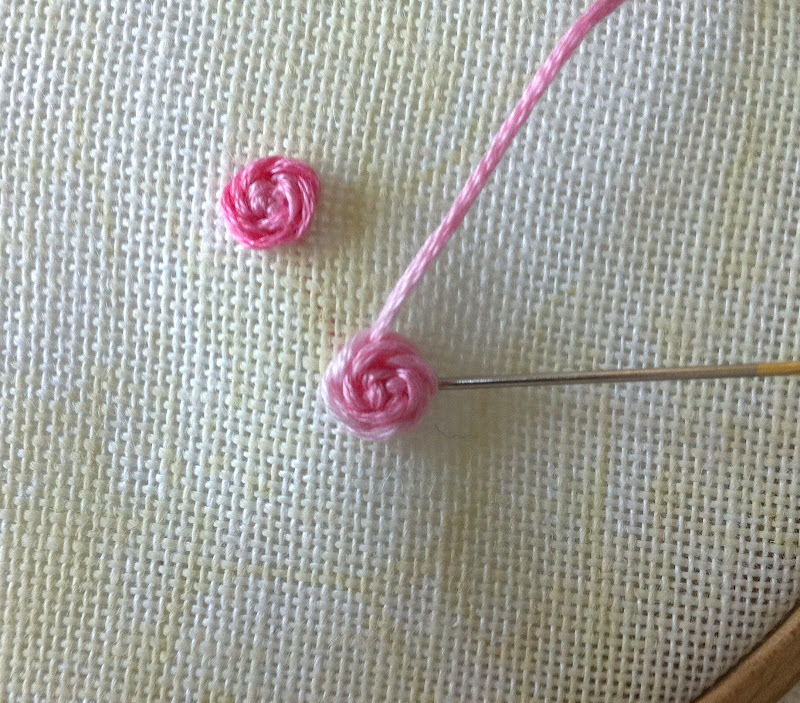 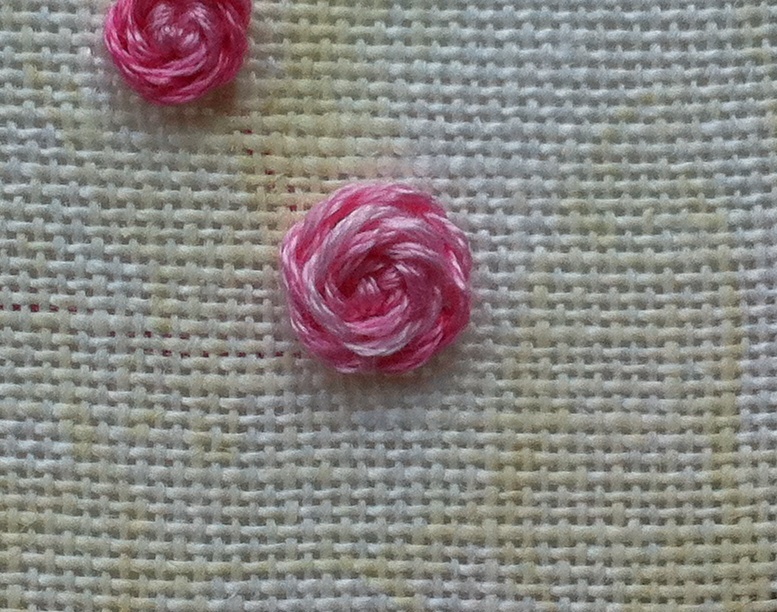 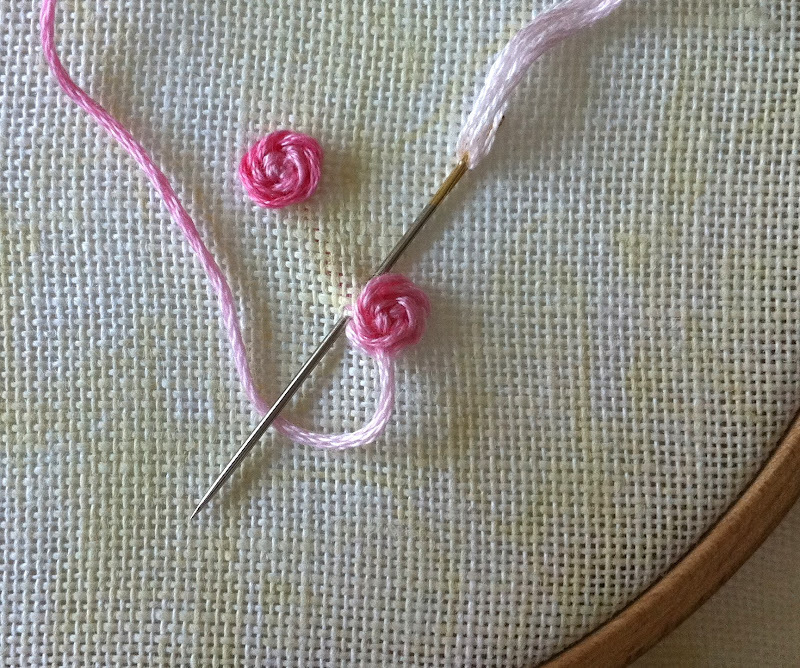 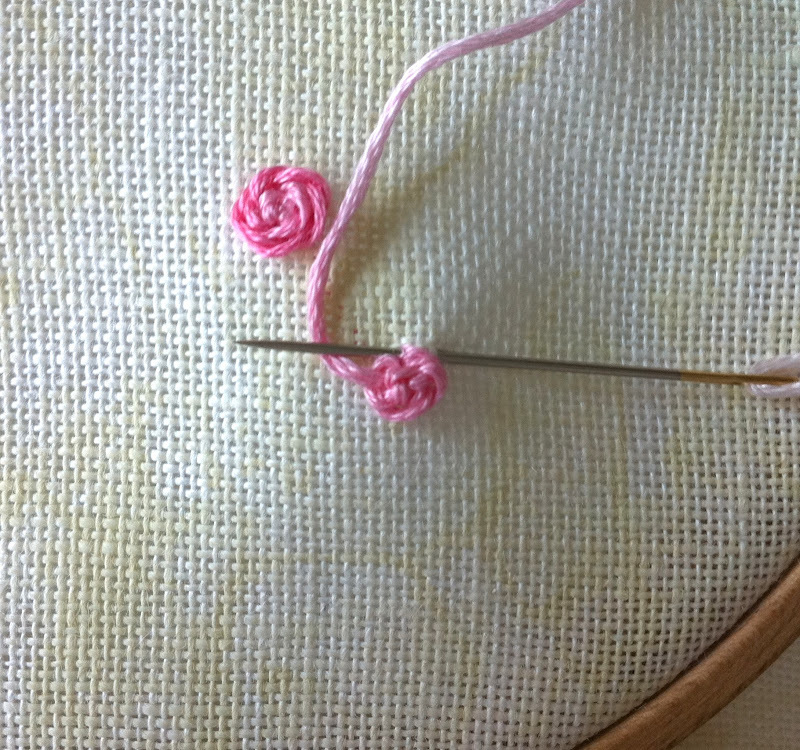 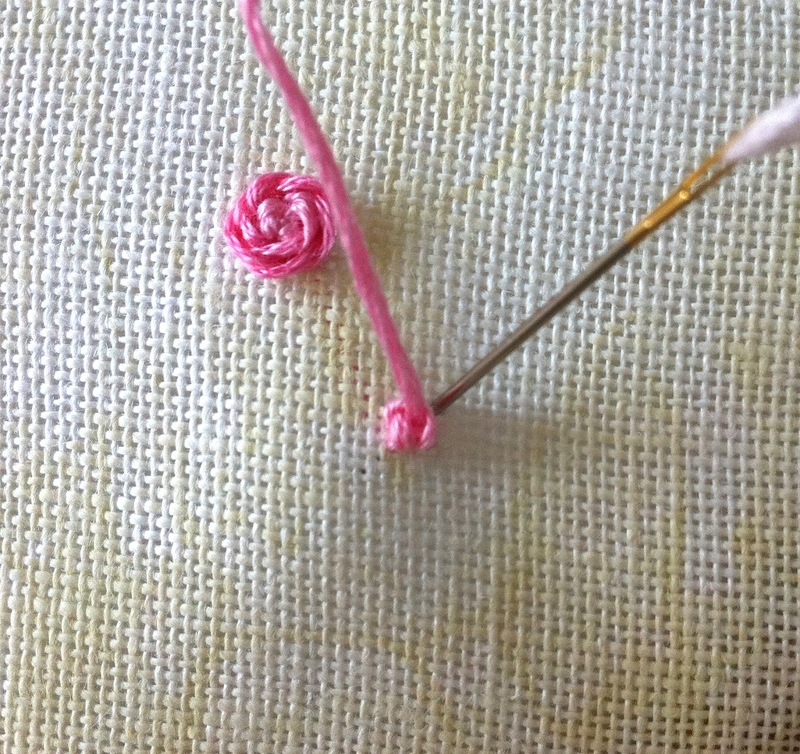 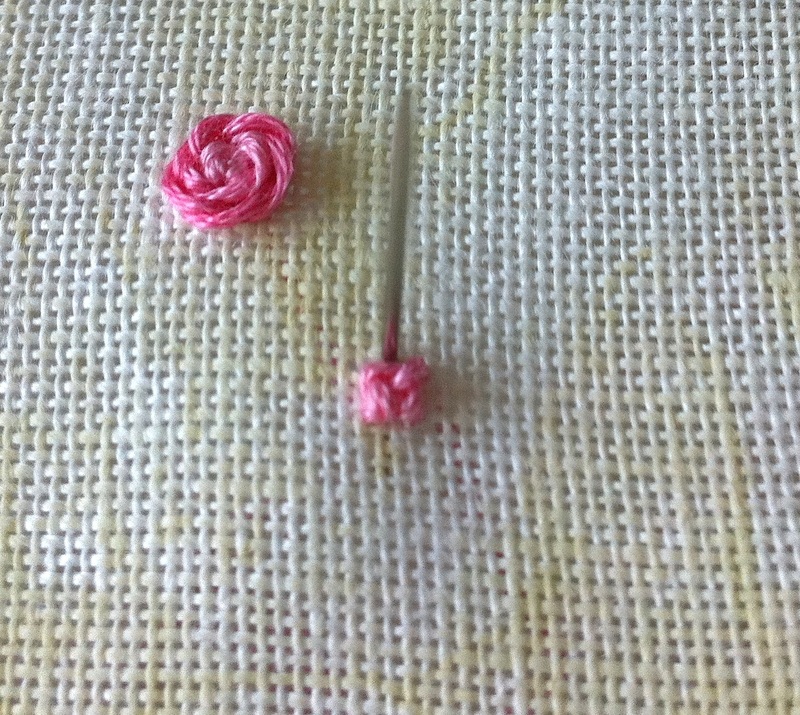 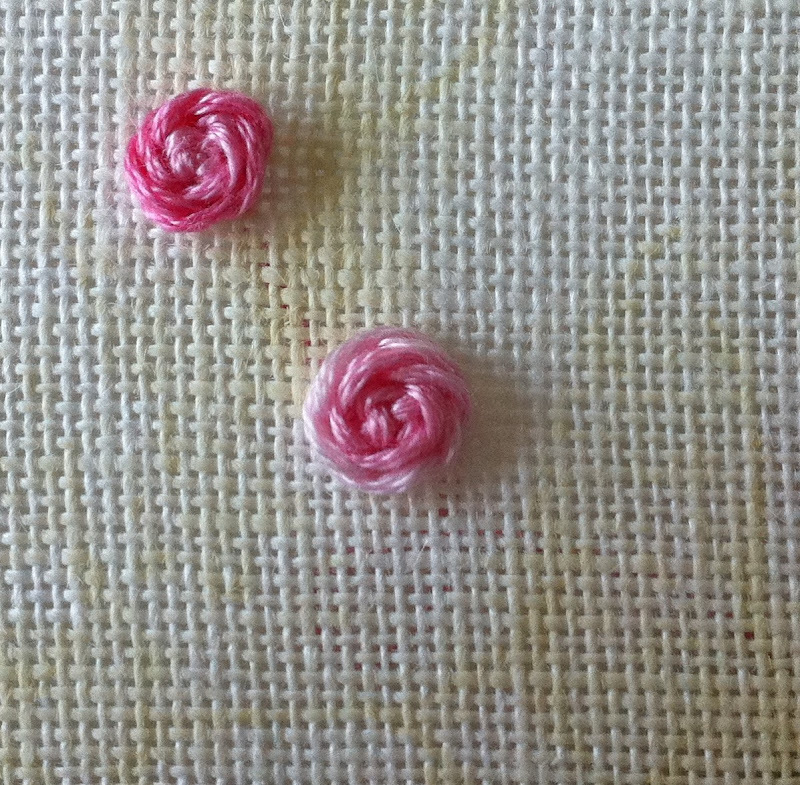 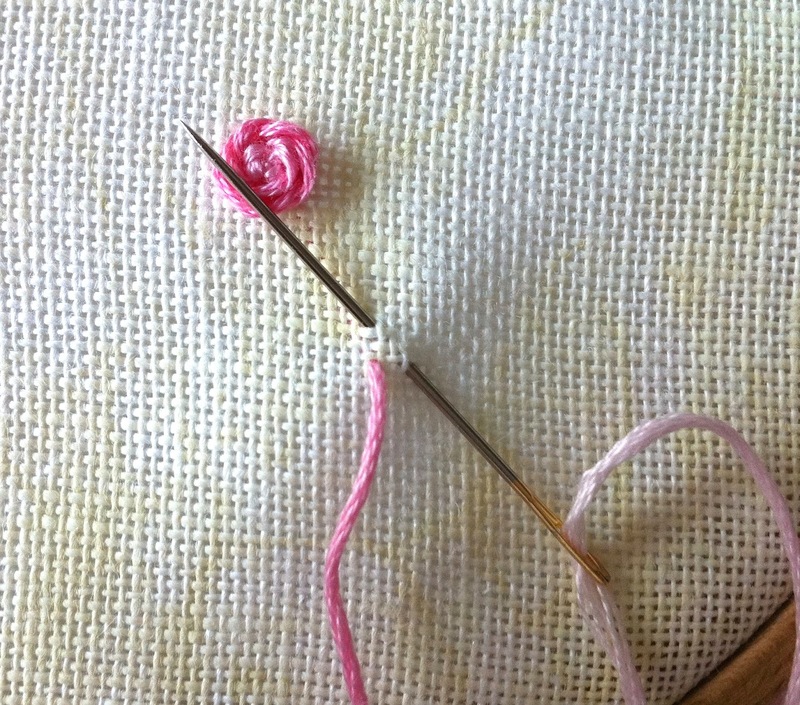 Now you have a lovely knot, which can stand by itself as a small flower, for instance, or as a filling stitch along with French and colonial knots. 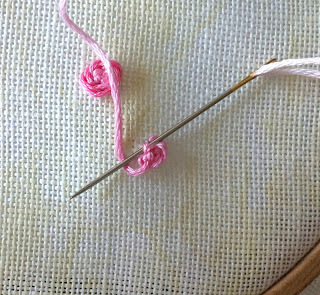 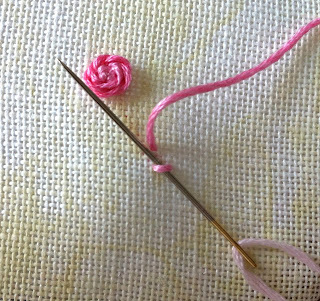 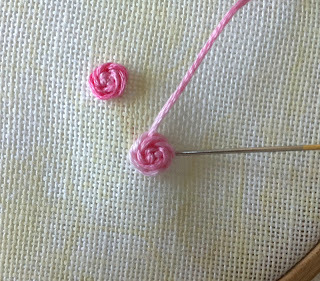 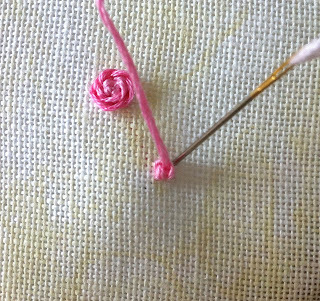 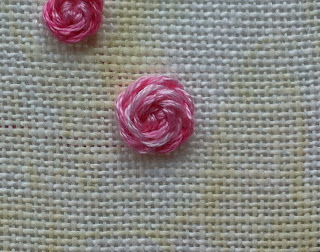 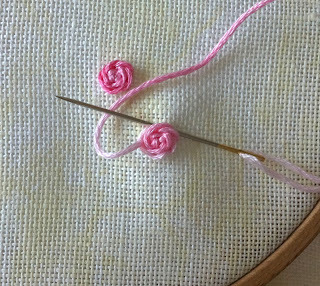 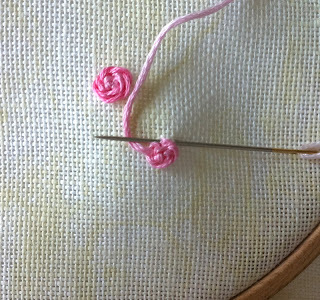 And making loops by sliding the needle under the little "legs" of the knot and over the working thread (just like stem stitching except not through the fabric) weaving all around the four "legs"
In the next post I'll show you how I stitched little rose buds, starting with the same knot as the rose and some cute leaves, too. 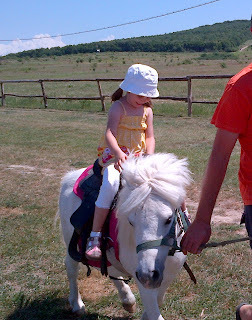 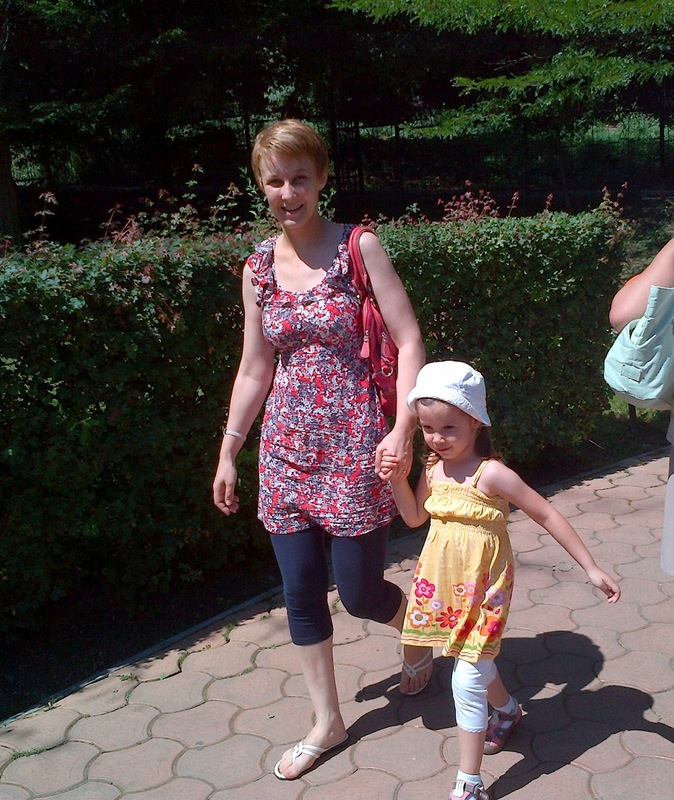 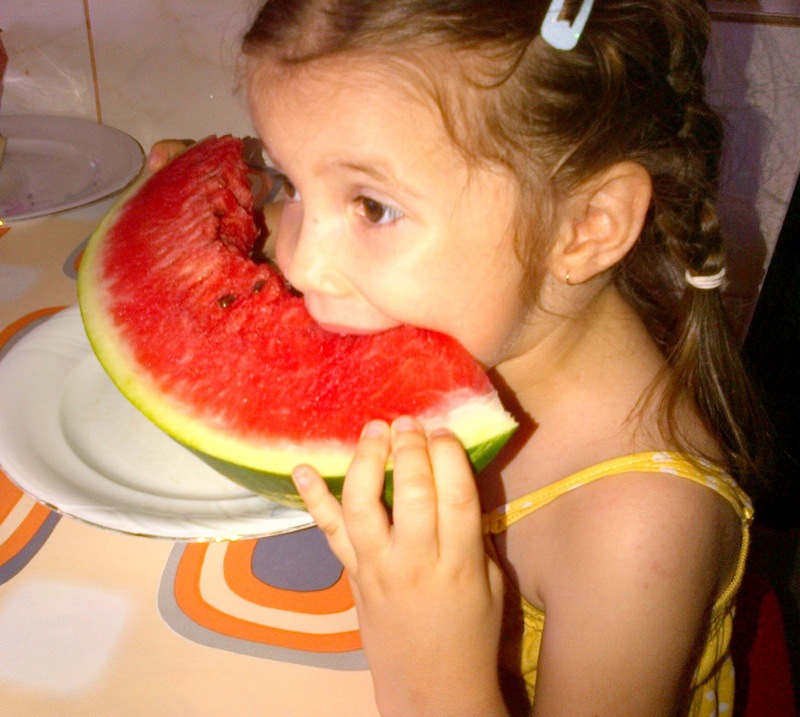 Hope you are having a fun day, Everyone! 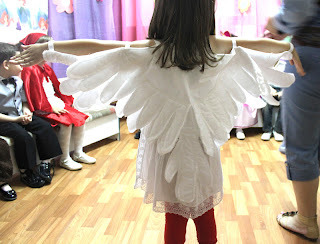 My daughter and two of her classmates are going to be doves in today's school play. A new play, a new costume challenge. Three, actually, as I volunteered to make all three sets of wings. 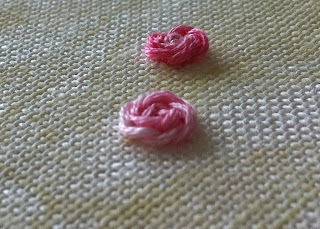 So it happened that I had a little less than six hours to figure out the "how to" and make them happen. 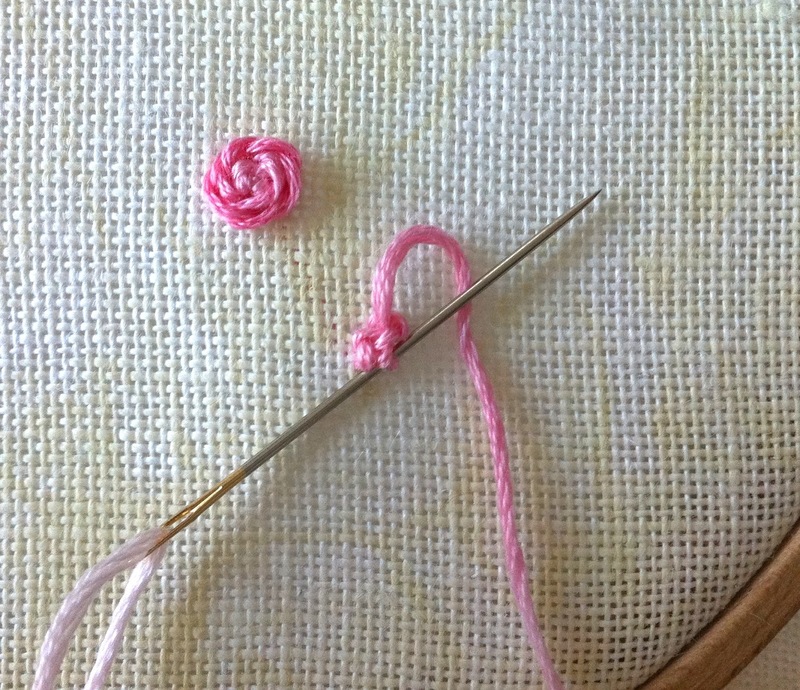 No time for searching the www for ideas, no time for shopping, just a quick stash raid, a cup of strong coffee to awaken my muse and rush, rush, rush. 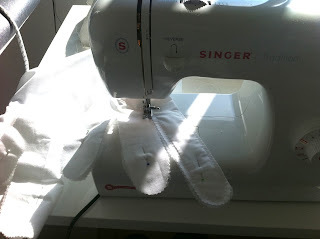 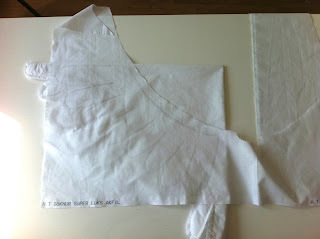 Luckily I had plenty of white cotton fabric (the kind used for sheets) and batting scraps, some bigger, some smaller... Well, I thought, that will have to do, let's see what happens. As all the girls are more or less the same size, I took one of my daughter's sweaters, measured a full arm length (abt. 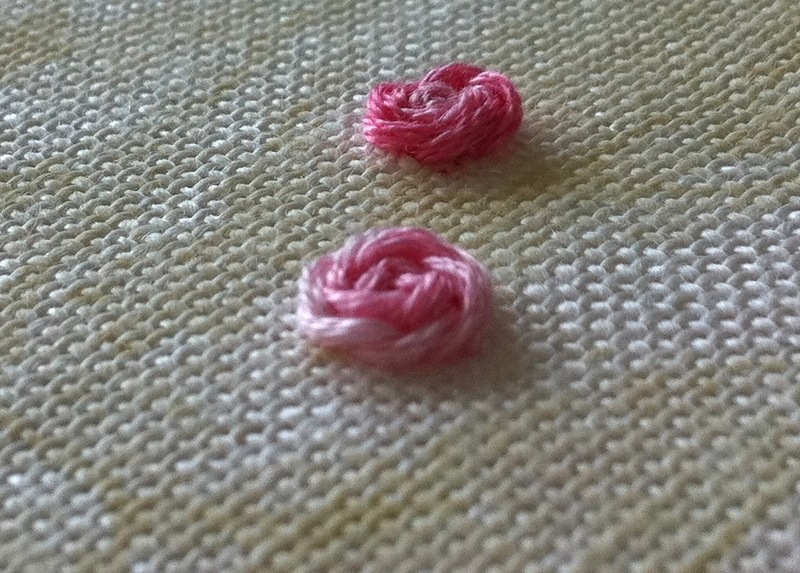 100cm) and a back length (abt. 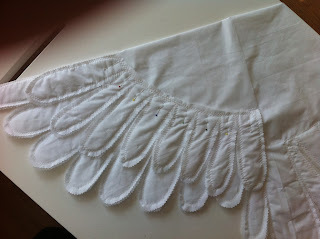 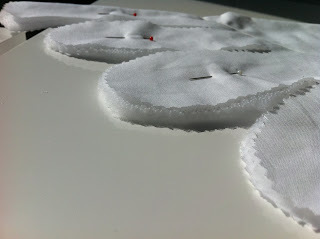 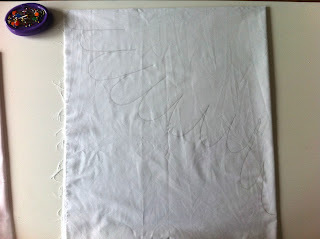 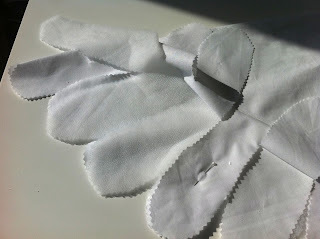 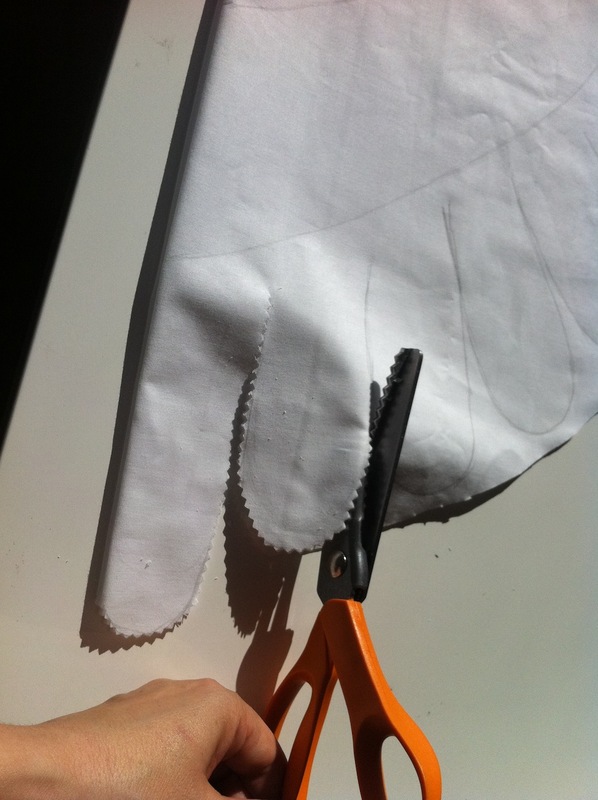 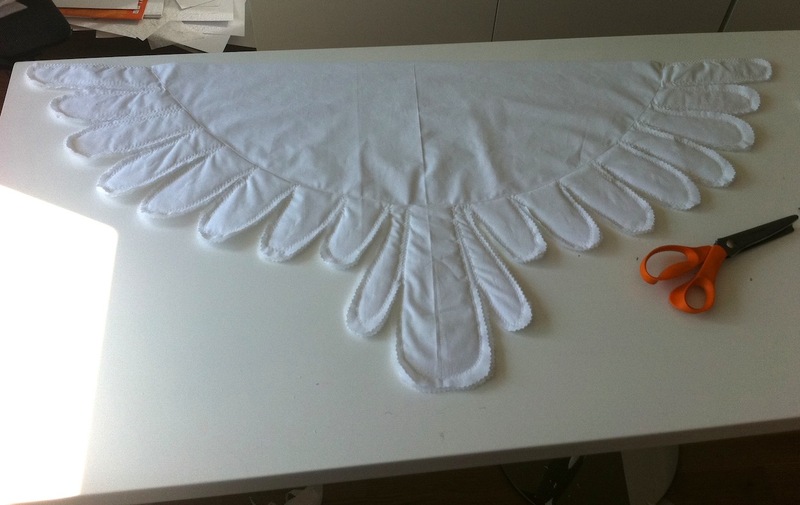 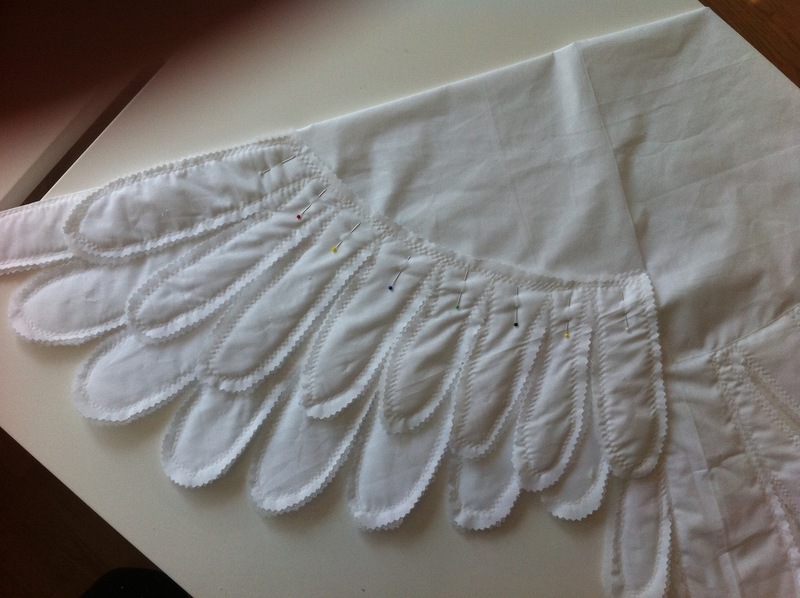 60cm), and cut a 100x120cm piece of white cotton. 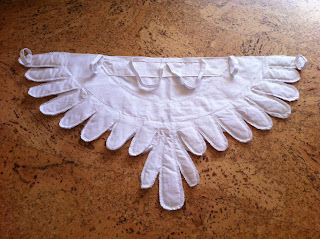 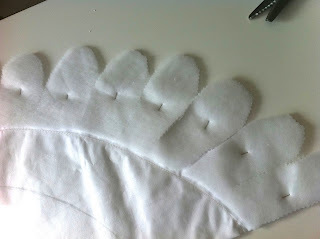 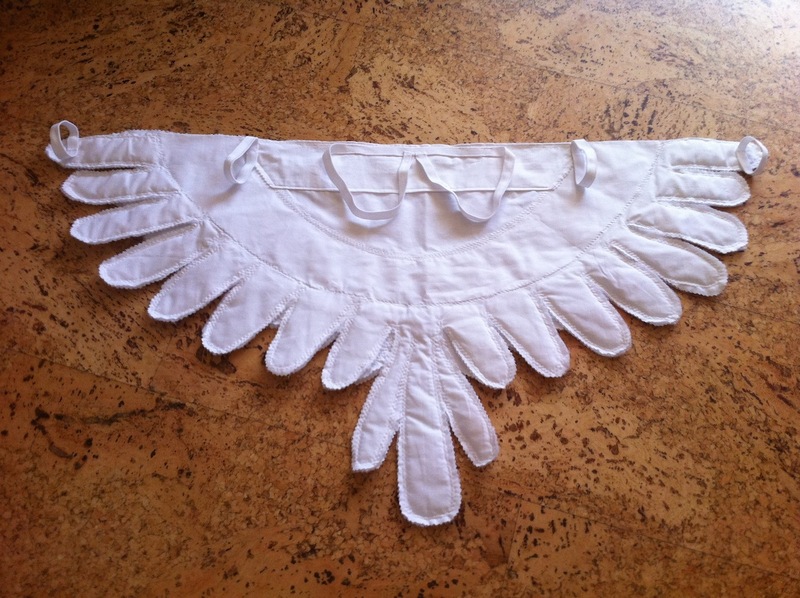 After sewing along the bigger arch, the batting came in handy to make the feathers a little fluffier. 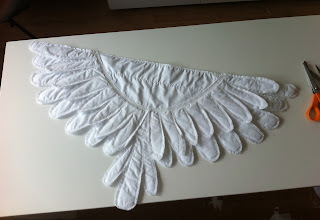 I pinned each two layers of feathers, placed them over the pieces of batting, pinning along, adding more pieces of batting, until all the feathers had a complete layer of batting under them and then simply cut the batting around the feathers. 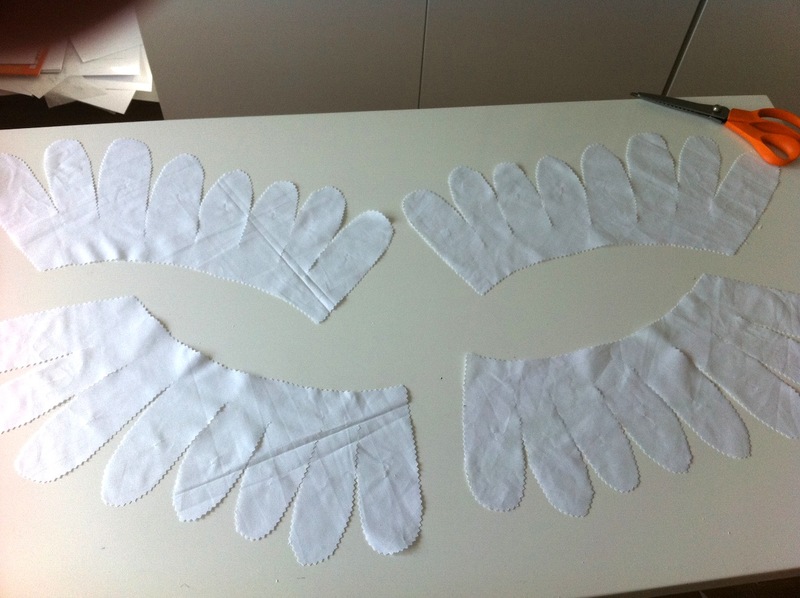 Time to make a second layer of feathers. 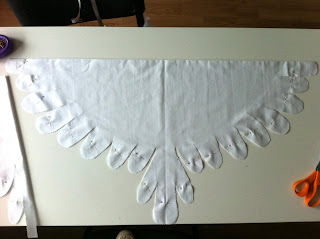 Taking the piece of cotton that fell off after cutting the wings (it was still as I folded it in four at the beginning), I placed one of the four layers of fabric over the sewn wing (folded in two on the width) and, guided by the smaller arch and the feathers already made, again, just drew feathers with my pencil, then put that layer back on the other three and cut again through the four layers with zigzag scissors. 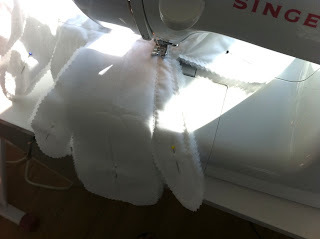 When both sides of the second row of feathers were sewn, they got attached to the wing by - guess what - zig-zag stitching along the arch. 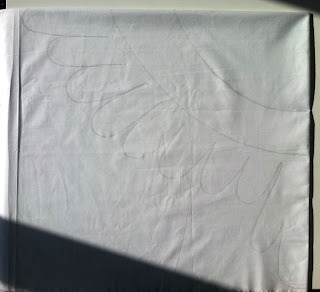 This is the moment when the first row of feathers might get caught under and stitched over... Ask me how I know! 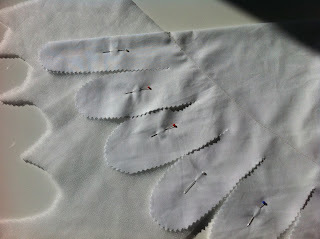 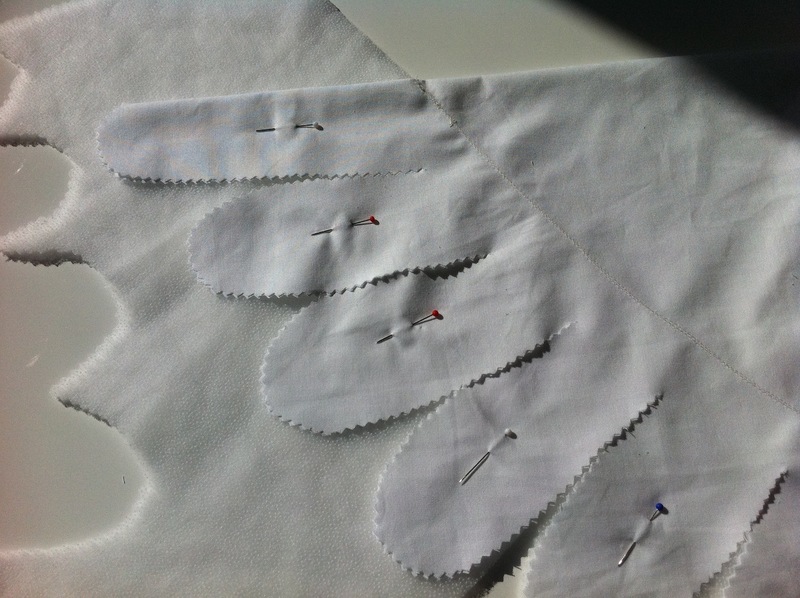 Then I sew an eyeballed size double fabric strip to the upper part of the wing, for supporting the elastic bands sewn on for shoulders, above elbows and wrists. And voilá, the first set of wings was done in exactly two hours! 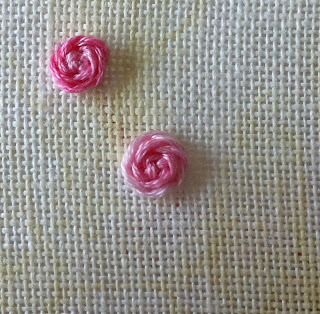 On to the other two I was, and finished them on time, too. The girls are really happy with their wings, I'll take photos of the three little doves during the play and will add to this post.